Casey awakens from a nightmare where “Dark Casey” appears once more to threaten April and Shadow. Disturbed, he goes to the kitchen for breakfast and Shadow announces that she won an online contest to go see the alien entertainer Bleebozz. Bleebozz, meanwhile, arrives via the Utrom transmat to a flurry of reporters. Bleebozz is a Meta-morph and can shapeshift to mimic other people, which is the core of his act. One reporter remarks that Bleebozz has been running low on fresh material and a flustered Bleebozz assures everyone that he has plenty of tricks up his sleeve. Later, Bleebozz meets up with a shady Utrom character who gives him a “hat” as per an earlier arrangement. That evening, the Jones family arrives at the show. Casey, being paranoid after his nightmare, brought his mask and gear with him, but it was checked at the door. Bleebozz then appears on stage and asks several famous athletes and artists in the audience to come up on stage. He then takes on their forms but, more impressively, he flawlessly mimics all their talents and knowledge. Bleebozz then calls a random seat number, which turns out to be Casey’s, and invites him up on stage. Casey reluctantly goes up, but before Bleebozz can do his routine, the alien begins to violently change against his will. He transforms into Dark Casey, who is thrilled to have taken on tangible form for the first time. Dark Casey smacks the real Casey aside and then charges through the audience and out of the building, taking Casey’s gear with him. Casey puts on his mask and tells April and Shadow that they need to stay behind, as Dark Casey is a menace he has to conquer on his own. Casey trails Dark Casey to an alley, following his own mental intuitions. Dark Casey attacks him with a baseball bat, but Casey counters the blow with a length of pipe. Dark Casey beats Casey down, explaining that he represents Casey’s suppressed anger, hatred and zeal for combat; traits he bottled up once he became “domesticated” by friends and family. Dark Casey says he’s been building up strength in the back of Casey’s head for years and the mind-reading helmet obscured in Bleebozz’s hat was what he needed to break free. Just then, April and Shadow catch up and Dark Casey decides to fulfill the promise he made years ago to take everyone Casey loves away from him. This enrages Casey, who rises from the ground and grabs a discarded hockey stick. Casey begins to beat Dark Casey to a pulp, but the maniac only laughs and encourages Casey to become the lunatic vigilante he was meant to be. Casey relents and comes to his senses, realizing that it’s Bleebozz he’s about to kill, not Dark Casey. Casey then rips off Dark Casey’s mask, which transforms back into the “hat” with the mind reading helmet inside. With Dark Casey vanquished, Bleebozz returns to normal and Casey happily helps him to his feet. Later, the Jones family arrives at the farm in Northampton to meet up with the Turtles (who have been meditating over all they’ve been through, lately). Shadow says that a news report has it that Bleebozz’s performing career is on hiatus while Utrom authorities look into his shady connections. Casey hopes that Bleebozz can get his life back on track. Casey then tells his family that it was because of them he was able to face his demons; a feat he never could have accomplished alone. As they meet up with the Turtles, Casey is proud to finally be free. *It is difficult to place this story in the timeline. It must happen during or shortly after TMNT Volume 4. At the very earliest, during the time gap in TMNT (Vol. 4) #5. April mentions that the Turtles are in Northampton meditating after “all they’ve been through”, which could point toward it taking place shortly after Volume 4 (which has yet to be concluded). 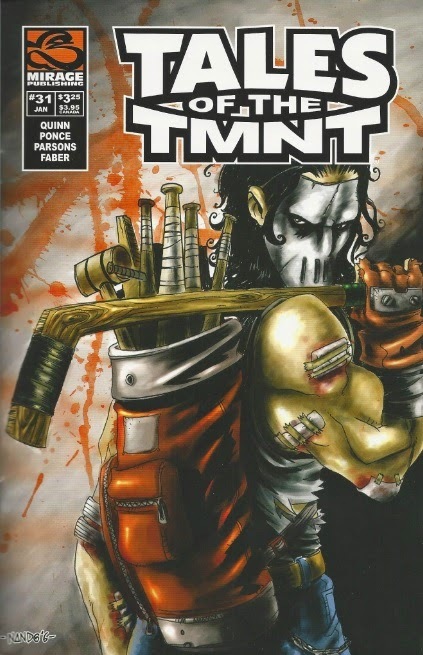 *“Dark Casey” first appeared in TMNT (Vol. 1) #58. He last appeared in TMNT (Vol. 2) #1. 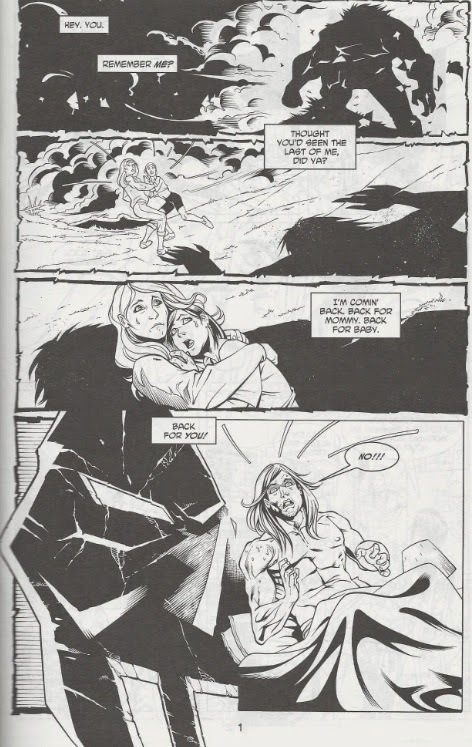 *Gabrielle died giving birth to Shadow in TMNT (Vol. 1) #58. *The mind-reading helmet disguised as a hat may be related to the menta-wave helmet, which the shadier cults of Utroms were shown selling on the black market in the story “The Grape”. “Dark Casey” was another of those unfulfilled plot threads left lingering for over ten years. 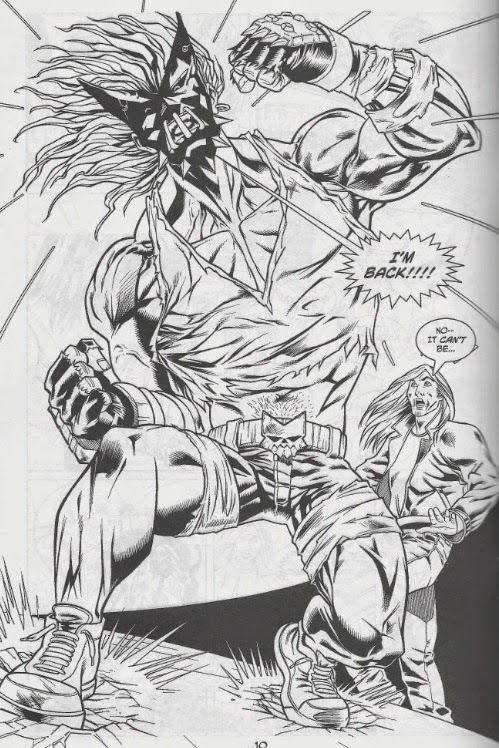 First introduced during “City at War” and then at the start of Volume 2, he was intended to be a spectral harbinger of doom and menace who would appear to Casey shortly before something terrible would affect his life. Due to the many awkward starts and stops of the Mirage TMNT storyline, as well as the rotating staff of writers, we never really got the whole deal with Dark Casey and the concept just sort of fizzled out and vanished. Both previous stories to feature the character came out in 1993, so he was sort of introduced and hyped all at once as this big deal… only to never be seen or mentioned again for 14 years. When it comes to the Mirage TMNT series, we should be grateful whenever we DO get a conclusion to a plot thread, as the norm tends to involve characters and concepts being introduced and unceremoniously forgotten. But I don't want to sound like a drag, since author Quinn Johnson does his research and pens a wonderful conclusion to the Dark Casey plot thread. So like I said, Dark Casey hadn’t been seen in 14 years, so you can appreciate why Casey nearly shits the bed when he has his nightmare at the start. Dark Casey has historically meant serious trouble for him. Johnson’s explanation for Dark Casey’s existence is probably something we all put together when reading the comics ourselves, but it’s an intuitive explanation. What I appreciate more is that Johnson ties it into Casey’s evolution as a character. He’s no longer the heavy drinking, skull-busting lunatic with a short temper that he was when Eastman and Laird introduced him. By this point in the Mirage narrative, he’d actively put that life behind him and is pretty much a full-time dad. You can call it “boring”, but he honestly did grow up and Casey discarding his mask for good (save a couple relapses) was a MAJOR turning point for the character. There’s a metatextual level to the script, as Dark Casey not only represents what Casey could have become had he not grown up, but he also speaks to all the readers who find Casey’s matured persona “boring” and WANT him to regress back to the vigilante psycho he used to be. That’s not who Casey is anymore and character regression is never a positive thing. What’s nice is that the subtext is there, but Johnson never lays it on too thick or actively admonishes the readers who want Casey the Vigilante to make a comeback. He just shows you why that would be counterintuitive to the growth of the character in this universe. And again to Johnson’s credit, he finds a neat way to bring Dark Casey into the physical realm by drawing on then-current plot elements from Volume 4. You’ve got the aliens mingling with humanity on Earth, but also the idea that Steve Murphy introduced in his Professor Obligado serial; that the menta-wave helmet technology has been purloined for recreational use on the black market. If you’ve been reading the comics, then Dark Casey’s physical manifestation doesn’t feel quite so forced, but picks up on other plot elements scattered about. Yes, there is the fact that Dark Casey hasn’t been mentioned in 14 years, so his showing up seems a little spontaneous, but that’s hardly Johnson’s fault and, again, it’s nice to get closure on this plot thread. As for where this story takes place, I’m of a few minds on the subject. I originally put it as happening during the time gap in TMNT (Vol. 4) #5, and it could very well go there, but I think a better slot might be in that unknown area “shortly after the end of Volume 4” (which, as of this writing, hasn’t been concluded). I suggest this partly because of the statements regarding the Turtles needing to recover from all they’ve been through, but also because this works as something of a coda to Casey’s character. Partway through Volume 4, April leaves him and he briefly goes back to being a vigilante; regressing as a character in a moment of hopelessness and desperation. I’d like to think that it was THAT moment which allowed the Dark Casey persona, which had been gestating in the back of his psyche for a decade, to reawaken. Here, now that Casey has his family and friends back, he faces his last demon, vanquishes it and comes to terms with himself. If we never saw Casey again after this, it would work as a wonderful farewell for the character, putting a definitive period on his arc and evolution throughout the series. But again, we have no idea how (or if) Volume 4 will conclude, so it’s precarious territory to place it there. I still think it’s a nice sentiment, though. Also, Andres Ponce’s pencils are lovely and he offers the best rendition of Dark Casey we’ve gotten. Jim Lawson’s version worked in an abstract way, being deliberately cartoonish in build to exaggerate the traits Casey was trying to suppress as he grew out of his vigilante phase. Ponce pares those features down a bit (the hyper musculature in particular) so he looks more consistent with the rest of the characters, but still retains those details that define his look. The action is staged really well and the fight in the alley just looks great. The three-man inking team also manages to keep things visually congruous from page to page, so the visuals remain consistent all the way through. “Reflections” is a wonderful tale that fulfills a plot thread we might have forgotten about. While at times it does spell out Casey’s arc a little too obviously (Dark Casey’s exposition during the final battle) and some of the symbolism is just a little corny (Casey’s mask shatters on his face as he comes to terms, though “not really”, it was just for effect), it still serves as a great reminder of how far Casey has come and just WHY Casey can never go back.